I have to confess, I'm not a huge fan of turkey. Every time I've ever had it, it has been dry and bland...YUCK! Every time that is until last year when I made this Emeril recipe. It was the most tender, juicy, delicious turkey I have ever eaten in my life and I will never make a turkey another way! EVER! (ok, that's a lie, I really want to try Alton Brown's brine version, but for now, this is the best turkey recipe I've ever had) It is a bit time consuming, but I promise you, it is every bit worth it!!! Remove everything from the cavity of the turkey. Rinse the turkey inside and out under cold running water. 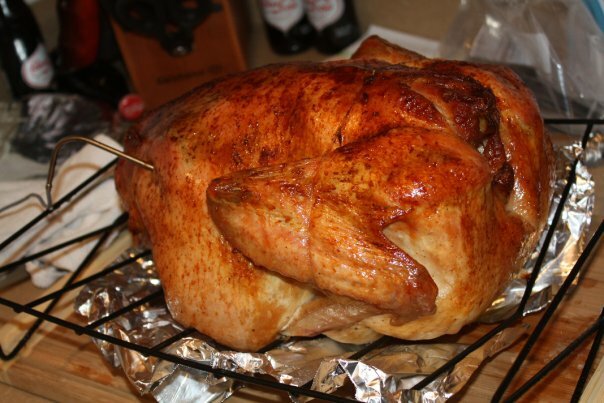 Soak the turkey in the brine, covered and refrigerated, for at least 4 hours and up to 24 hours. Remove from the oven, turn, and baste with 1/2 cup chicken or turkey stock. Continue roasting with the breast side up until an instant-read meat thermometer registers 165 degrees F when inserted into the largest section of thigh (avoiding the bone), about 2 3/4 to 3 hours total cooking time. Baste the turkey once every hour with 1/2 to 3/4 cup chicken or turkey stock. Pour the reserved turkey pan juices into a glass-measuring cup and skim off the fat. Place the roasting pan on 2 stove top burners over medium heat add the pan juice and 1 cup turkey broth and the white wine to the pan, and deglaze the pan, stirring to scrape any brown bits from the bottom of the pan. Add the remaining 3 cup of broth and bring to a simmer, then transfer to a measuring cup. In a large heavy saucepan, melt the butter over medium high heat. Stir in the flour and cook, stirring constantly, to make a light roux. Add the hot stock, whisking constantly, then simmer until thickened, about 10 minutes. What's on your MUST HAVE list for Thanksgiving?!? OMG...I think I might try this. I've never made a turkey on my own before, so I'm terrified. but this sounds great! My husband and I have made the Alton Brown version for the past three years (this will be our fourth year) and every year it comes out better than the last, and every year everyone RAVES about how delicious the turkey is! Definitely give it a chance—it's changed my opinion about turkey!